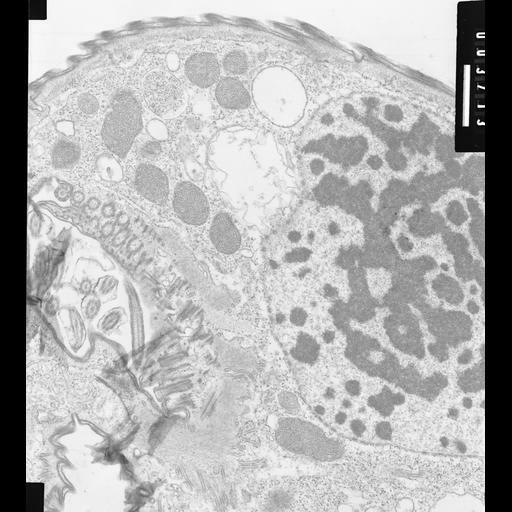 High resolution overview of Opercularia coarctata with macronucleus, cytoplasm, and section of the oral area. Specialized rough endoplasmic reticulum with modification into decorated tubules that lie on the surface of myonemes. The composition and function of the decorations have not been determined but they may be calcium pumps or calcium channels. TEM taken on 6/6/69 by R. Allen with Philips 300 operating at 60kV. Neg. 11,800X. The raw film was scanned with an Epson Perfection V750 Pro. This image is suitable for quantitative analysis. Standard glutaraldehyde fixation followed by osmium tetroxide, dehydrated in alcohol and embedded in an epoxy resin. Microtome sections prepared at approximately 75nm thickness. Additional information available at (http://www5.pbrc.hawaii.edu/allen/).